Add a little attitude to your dog's look! 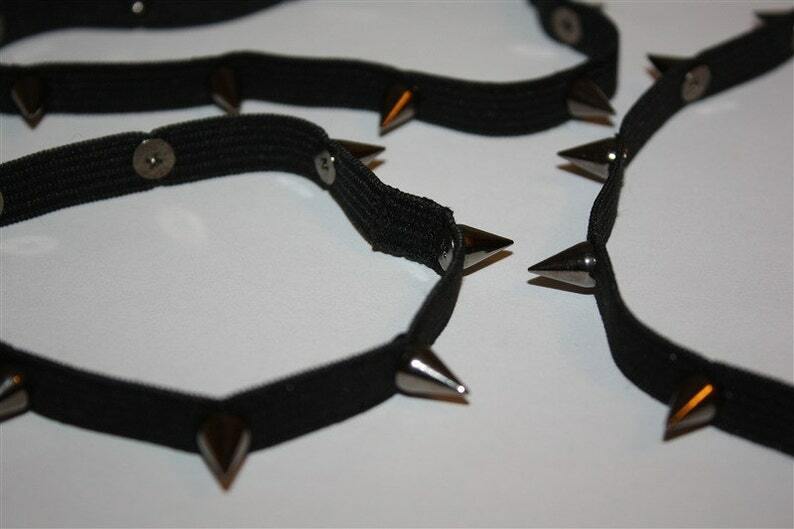 These spiked elastic dog necklaces are a tough-yet-fashionable addition to your pup's appearance. Since they're made with sturdy extra-stretch elastic they're very comfortable for and well received by most dogs and even cats! Since these are made with extra-stretch elastic, most necklaces can stretch to fit small to large dogs comfortably. The sizing details below will tell you the minimum and maximum size necks they will COMFORTABLY fit. To choose the right size and ensure maximum comfort for your canine friend, however, choose the size his or her neck is closest to the MIDDLE of. Example: If your dog's neck is 19" (48cm) around, the Large sized necklace is ideal for him/her but sizes Medium and Extra Large will both fit quite comfortably as well. Size small will be too tight. Custom - made to fit! For additional assistance with sizing, simply send over your dog's neck size and we'll let you know what's best! If you require a size smaller or larger than what we currently have listed, just select the Custom option that suits your needs and notate how many inches/centimeters around your dog's neck is. Please note that these are necklaces - not collars. They are for fashion purposes and are not meant to be attached to leashes or restrain your pet.